An endodontist is a dentist with advanced training in treating the diseased or damaged pulp, or soft inner tissues, inside your teeth. Endodontists spend at least two years after dental school training to become specialists in the techniques and procedures involved in diagnosing and treating dental problems that originate inside your teeth. In practice, they perform only endodontic procedures and have extensive experience in this area. Endodontists save teeth. All dentists are in the business of saving teeth, but endodontists are specialists experienced in treating complicated cases, and are trained to save teeth with deep decay, abscessed teeth and even teeth that have been knocked out. They also diagnose and relieve oral and facial pain, perform surgery when necessary, treat traumatic injuries to your teeth and bleach discolored teeth. In all of these cases, the pulp in your teeth is infected or damaged. To save the teeth, endodontists remove the diseased or damaged tissue inside the tooth, and clean and fill the remaining space. This procedure is commonly called a "root canal." The pulp, or soft inner tissue of your tooth, is normally surrounded and protected by a layer of dentin. Above the gumline, the dentin is protected by a layer of enamel; below the gumline, the dentin is covered by cementum. When a crack or cavity destroys these protective layers, the pulp is exposed to the bacteria in your mouth. This can result in infection, and eventually, an abscess. A severe blow to the tooth can also damage the pulp. 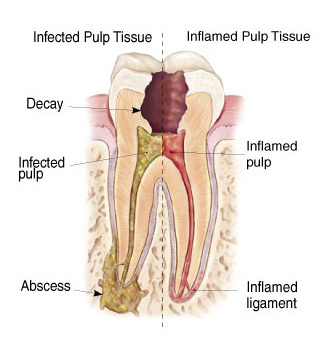 Endodontic therapy removes the infected or damaged pulp and/or abscess and returns the tooth to a healthy condition. Couldn't I just have the tooth removed? You could, but then adjoining teeth can shift, interfering with biting and chewing. Loss of a tooth can also lead to gum disease and loss of additional teeth. You can have a replacement tooth implanted or attached to adjacent healthy teeth, but this can be expensive and requires even more dental work. There is no real substitute for your own tooth, which is more efficient in chewing and biting than an artificial one would be. Can't my regular dentist treat these problems? General dentists do have training in these procedures, but your dentist has referred you to an endodontist due to the complexity of your case and feels that the advanced skills of an endodontist will serve you best.